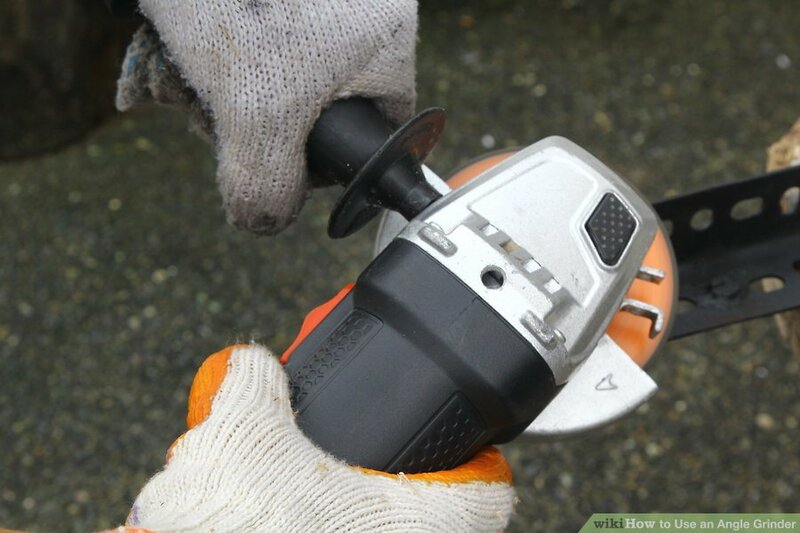 If you are thinking of using an angle grinder, then this is a perfect article for you. Using an angle grinder might seem like a hard task, one might be tempted to even think that only a professional can handle it. You can use an angle grinder in the comfort of your home for maintenance purposes like sharpening, polishing, sanding, grinding and cutting.How do I use angle grinder myself? Well, the process of how to use an angle grinder is quite simple as long as the right tools are used and safety is applied. Angle grinder imply the use of various angle grinder disk types. Apart from home maintenance, the use of angle grinder machine is also used in construction and metal works. Cutting sheet metal with angle grinder requires more skills and safety during the process. In this article we are going all you need to know on how to use angle grinder machine. Before using an angle grinder you need to first familiarize yourself with all its features: these features include; cutting wheel/disk/blade, wheel guard, auxiliary handle, spindle lock button, vent, locking power switch and power cord. Make sure you read the manual to familiarize yourself with the functions available and to identify all important features.Kindly ensure that grinder safety is put first. The following angle grinder safety precautions will be of great beneficial when using the machine. For new wheels make sure you run them in a protected area to ensure that it is not defective. OK! Now lets learn on how to use a grinder machine. Different projects have different grinders to use. Choose a grinder best suited for your project. For big jobs, the best angle grinder to use is the electric grinder because it’s more powerful and covers a large surface area. For small jobs, the best type of grinder to use is the pneumatic grinders since it’s less powerful and best used in small spaces. There are different types of disks. You should choose a disk that is best for the work you want to do. Kindly, do not use a disk for a purpose that it is not intended for. For grinding concrete and metal use grinding disk. For polishing works, use polishing pads and sanding disk. For cutting metal sheets, pipe, tile, masonry and wire use a cutting disk. To remove rust and paint use brushing wheels. For grinding concrete and metal use grinding disk. For polishing works, use polishing pads and sanding disk. Forcutting metal sheets, pipe, tile, masonry,and wire use a cutting disk. To remove rust and paint use brushing wheels. Before using a grinder carefully read the manufacturers manual and make sure you understand the manual well and carefully follow the instructions. Secure the guard properly and make sure that you clamp whatever you are working on firmly on a steady surface. Do not hold your grinder on the edge of your work but rather hold it firmly against the body of your work. You can now turn the angle grinder on and use it. To avoid the grinder slipping and causing you an injury, hold the grinder across the body of your work in the direction of the handle. After completing grinding, lift your grinder slowly and gently off the surface of your work and switch it off. For cutting a concrete use a diamond blade. On both the front and the back of the concrete put a mark on the outline. To ensure you get a better finish, kindly make sure that the marked outline is accurate. With the front facing up clamp the concrete to your workbench, do it firmly to ensure that you don’t cause yourself an injury as you make the cut.Start your angle grinder, on the front face of your concrete score around 1/8 in deep around your outline with the diamond blade. 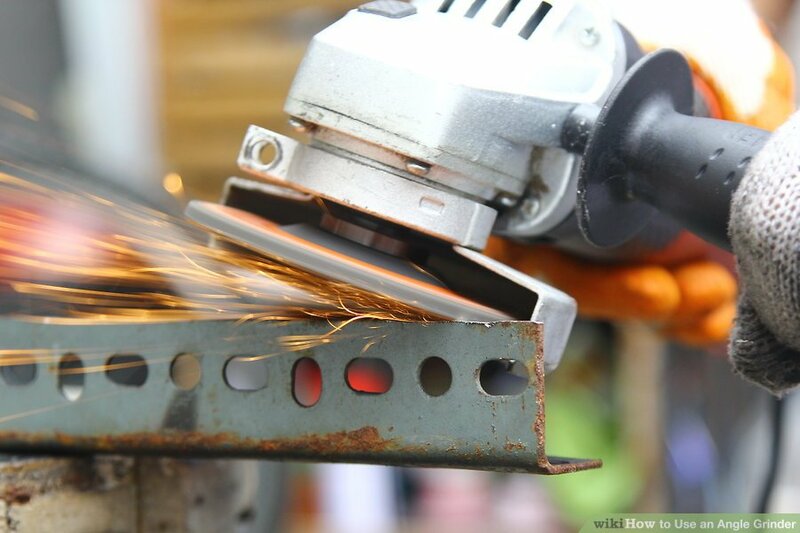 While cutting sheets metal, an angle grinder saves time and is convenient as opposed to using a hacksaw. An inexpensive cut off wheel is best used while cutting a metal sheet. Securely prop up the metal sheet. For safety, purposes wear safety boots while cutting of metal sheets. Start your angle grinder and allow the disk to get to high speed. Place the cut off wheel on the metal sheets and allow the angle grinder to do most of the work. 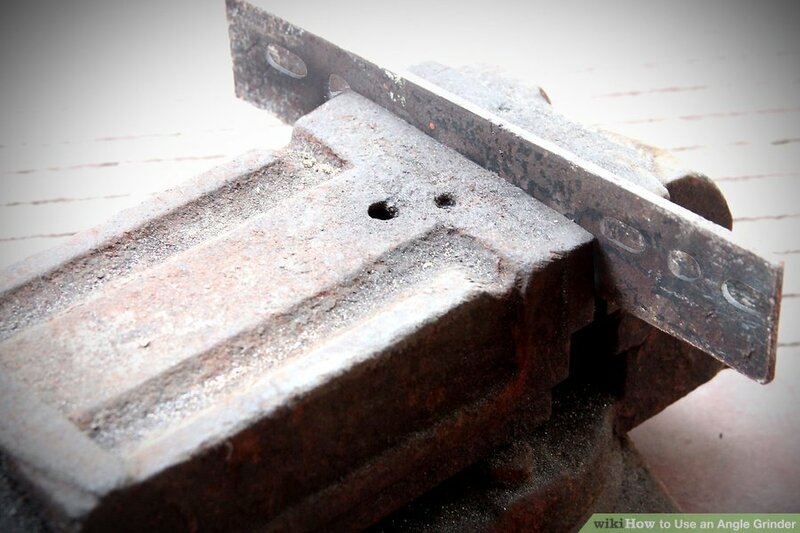 The shortest part of the metal should be the one to fall away. While shaping, sanding and carving wood an angle grinder is an effective tool that you can use. For safety measures, wear safety goggles and a dust mask while using an angle grinder on wood. Take into account how much wood you need to be removed and how fast you need the job to be done. This helps to note down which woodworking attachment to use. An angle grinder usually has a speed of 13000 revolutions per minute, hence can be able to cut down a large amount of wood. 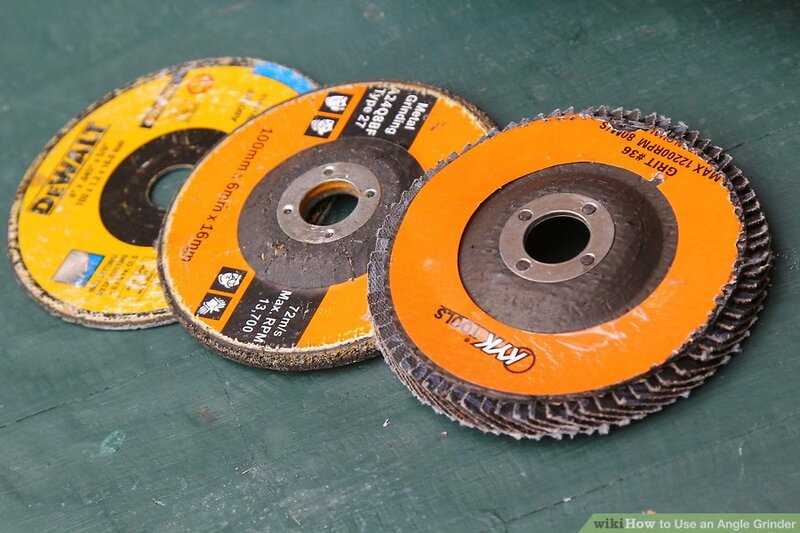 While using the angle grinder on wood there are three disk types that you should consider, this includes abrasive flap disk, abrasive carving disk, and carving wheels. Abrasive carving disk has razor sharp saucers and its best used for shaping wood. Abrasive flap disk contains small pieces of sandpaper joined to a backing disk; its best used for sanding wood and can also be used for removing small pieces of wood. Carving wheels are heavily toothed with sharpened steel/ alloy teeth and its best used on non-ferrous wood. Which angle grinder should you choose for welding? For your welding purpose, you might be wondering which angle grinder you should use be using for welding. However, you should be aware that searching for the best grinder is indeed not a trivial venture. Researching on brand name competitors and checking off essential specifications worthy necessary for welder’s trust.Choosing the best angle grinder for welding is vital decision therefore careful analysis is an inevitable major option available. Fortunately, the best angles grinders for welding are relatively inexpensive hence allows you to concentrate on the benefits that would drive your welding projects forwards. Through our comprehensive analysis and testing various angle grinders for welding, we would proudly recommend Makita 9557NB2 thanks to its numerous benefits to welders. This is a first-class welding tool with a 4.5″ AC/DC. It has got remarkable operating benefits and various positive features. For beginners, you will enjoy amazing offers from online retailers and Makita as well. Purchasing two angle grinders just for the price of one for instance. Is that crazy? That sounds marvellous. I know you would not like to miss that offer.Practically speaking, The Makita 9557NB2 has got a powerful motor that delivers up to 11000RPM hence high welding performance. With its protective varnish and solid construction, you get the desired durability. This helps in preventing external contamination of the motor and seals the grinder’s bearings. Not forgetting it convenience with a slide switch with lock-on. The side handles can be positioned from both sides and a push button spindle lock. Alternating Current/Direct Current switch therefore it offers an alternative power source option. 100% ball-bearing design as well as durable metal gear housing. Reduced energy and heat loss from tightly wound coil wire. You will have to buy batteries separately. No complementary grinding wheels offered. Having gone through this article, you will agree with me that using angle grinder is never complicated. 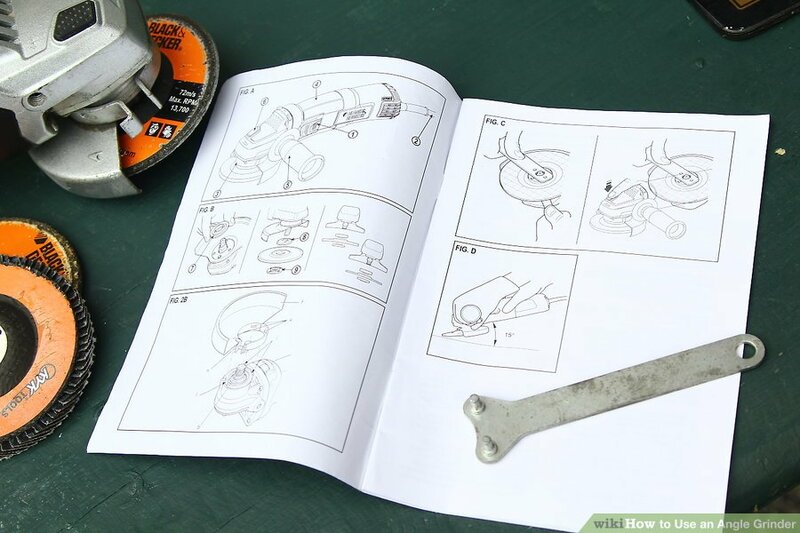 Confidently, from this guide, you have gripped some of what your angle grinder and various operations your tool is equipped for. If you follow the guide appropriately, we are sure you will be accurately and safely cutting, sharpening and grinding with the best of them in no time. Also, Learn more using bench grinder tips!